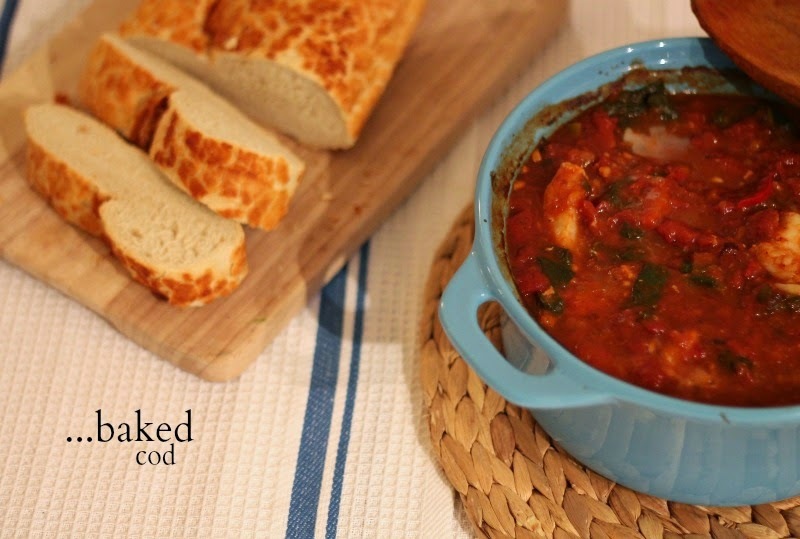 After trying a few variations of this tomato and chilli based cod stew I think I've nailed it. Warming yet fresh, this is the perfect meal during these colder months but would also be delicious enjoyed on a warm evening in summer. Start by crushing your garlic into a pan with a chopped onion and chilli, and frying on a medium heat until the onions are golden. Empty in the tins of tomatoes and 400ml of vegetable stock, along with the red pepper (sliced) and season well with salt and pepper. Throw in some oregano or mixed herbs if you fancy. Simmer on a low heat for about an hour. If you aren't watching the calories a slosh of white wine would be a good addition! This tomato sauce is best if left to simmer away for about an hour so the flavours can develop - or you can pop in the oven on 200C. When the sauce has started to thicken, add a couple of handfuls of spinach and stir into the sauce. Once they have begun to wilt, place the cod fillets in the sauce and push in so they are submerged. I use frozen cod fillets from Lidl (under £3 for 4 fillets) and depending on size and appetite add 1-2 per person. Pop in the oven on 200C for 25 minutes or according to packet instructions, before serving with rice and/or crusty bread. You will probably have leftover sauce - I purposely make a large quantity so I can freeze the leftover sauce and defrost again another day. Simply defrost and then cook again in the oven with the cod as before. In terms of other additions, thyme or basil work well as well as a handful of king prawns and black olives. This sounds delicious, I will have to try it next week! This looks delicious! I've made something similar but it was less of a stew texture, I like the look of this when stock is added too!